I've always been a big fan of Halloween. Like I've said before (and many times over) I love dressing up. But somehow, Halloween gets screwed up every year. #1: I purchased a sailor girl costume online last year but could never bring myself to wear it. The dress itself isn't trashy but I bought it with the intention of altering it to make it more unique. I thought I would cut the one-piece dress and hem it into a top to wear tucked in to a high-waisted pencil skirt. I also swapped out the cheap, nurse-inspired sailor hat that came with the dress for one that is more captain-esque (please excuse my fashion vocabulary). This came together pretty well and reminds me of the whole vintage pin-up sailor girl icon. Something about it just isn't entirely "me" though...maybe it's treading too close to the costume-in-a-bag dilemma. 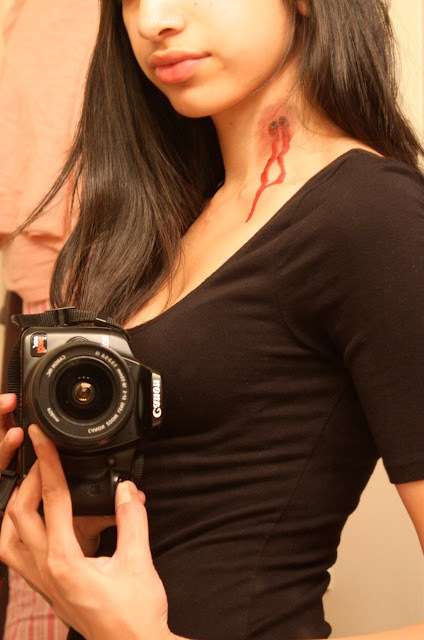 #3: Vampire Victim. This was my original idea for this year, mostly because it's simple, low key, kind of cute and, most importantly, creative. The only drawback is I don't want people to think I'm going for the whole Twilight thing (never read or seen it but from what I understand, there isn't any actual biting in it. Either way, just not what I'm going for). My take on the costume is to wear what I would normally wear to a party, exaggerate my hair (after all, it is Halloween!) maybe do a somewhat drained look on my eyes using gray eyeshadow, and lastly: the bite marks on my neck. I did a tester tonight out of boredom using whatever was in my makeup bag. This took all of 2 minutes, but naturally I would put more time into it on Halloween night. I think I'm going to go for option #3. Any thoughts?? Oh and does anyone know why they don't play the Monster Mash on the radio anymore??? I live for that song at this time of year!